"Kremling" redirects here. For information about the enemy referred to as "Kremling" in Donkey Kong 64 and DK: King of Swing, see Kritter. The Kremlings are a race of crocodilians who appear in the Donkey Kong franchise. They first appear in Donkey Kong Country, where they steal Donkey Kong's prized Banana Hoard. Kremlings come in many different varieties. Most Kremlings are part of the Kremling Krew (with K. Lumsy being an exception). Kremlings also made a few appearances in various sports titles in the Mario franchise. Kremlings can be seen in the background of the DK Jungle Court in Mario Power Tennis; they take on the role of goalies in Super Mario Strikers and Mario Strikers Charged, while in Mario Super Sluggers, they appear as team players. The Kremlings appear to originate from Crocodile Isle, an island close to Donkey Kong Island that disappeared from the map during the events of Donkey Kong Country 2: Diddy's Kong Quest. However, various ruins on Donkey Kong Island, such as the ones in Millstone Mayhem, depict Kremling visages, potentially meaning they have some history there as well. Kremlantis is a semi-submerged complex that also features several temples with Kremling visages. In a similar manner to Koopas, Kremlings are depicted with multiple body shapes and statures, the most common being bipedal and humanoid. Some however, such as Klaptrap, are quadrupedal, with a tail dragging behind them like real life crocodilians. Bipedal Kremlings, such as Kritters, often have distinctly humanoid torsos with pectorals, navels and distinct shoulders; some have even more of these characteristics, such as external ears and hair. Many Kremlings are quite large, rivaling the size of Donkey Kong, who himself is known to weigh 800 pounds. Still others are much larger, such as K. Lumsy and Kerozene. Kremlings appear in a wide variety of colors, such as blue, red, grey, purple, and orange; however, the most common colors seem to be the various shades of green. The Kremlings seem to have some level of leadership and government, as evidenced by King K. Rool and KAOS. How these leaders are actually chosen is unknown, however. Due to comments made by Klubba about how the Kremlings are "miserable" under King K. Rool, it seems more likely that the Kremlings may be ruled under a dictatorship, with one Kremling simply taking the position of leader. This is shown in Kremkoins, K. Rool's Keep and a shield in Krocodile Kore. Kremlings are known to be rather apathetic regarding industrial safety; this can be seen with Kremkroc Industries, Inc., Mekanos, K3, Frantic Factory, Ghost Island and Chill 'n' Char Island, the factories making up the first of these being referred to by the Donkey Kong Country manual as "The Kremling's crowning industrial achievements." From this, they tend to cause large amounts of pollution, as seen with Poison Pond. This contrasts with the Kongs, who are typically shown to be in harmony with nature. In contrast to other intelligent animal species that are technologically primitive, the Kremlings possess relatively advanced resources, including robots, airships, submarines, warships, spaceships, and powerful weapons. The Kremlings seem to be a marauding and conquering race, as evidenced by their thievery, kidnapping, take-over of the Northern Kremisphere, and common usage of pirate ships such as Gangplank Galleon. It is also possible that they showed similar sides in the unseen Kremean War, which they are assumed to have fought in. Wrinkly Kong attempted to teach Kremlings at a school in Crocodile Isle; however, they displayed low intelligence, as evidenced by the incorrect sums on the blackboard, while another attempted to bring his sword to class. Not all Kremlings are bad, as demonstrated by K. Lumsy, and to a lesser extent Krunch and Klubba. 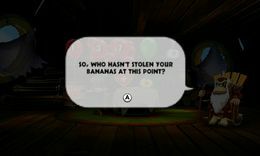 Upon entering his shop in Donkey Kong Country Returns and Donkey Kong Country Returns 3D, Cranky Kong sometimes greets DK by ironically asking him "who hasn't stolen [his] bananas at this point", thus indirectly referencing how the Kremlings were involved in the theft of the Banana Hoard before the Tiki Tak Tribe was. He also sometimes tells him "See you later, alligator!" before chuckling to himself when he leaves. In the animated series, they are never referred to as "Kremlings". Instead, they are referred by various generic terms, such as "lizards" and "crocs". The Kremlings originate from a canceled PC/Mac adventure game by Rare named Jonny Blastoff and the Kremling Armada. 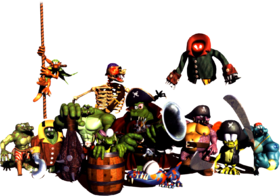 In the original Donkey Kong Country trilogy, the Kremlings share the same sounds in various pitches (except Klaptrap, Klobber, Kudgel, Krumple, and Kuff 'n' Klout).